According to Sass and others (1998) and Vugrinovich (personal communication, 2000), temperature measurements of the Mt. Simon are very scarce. 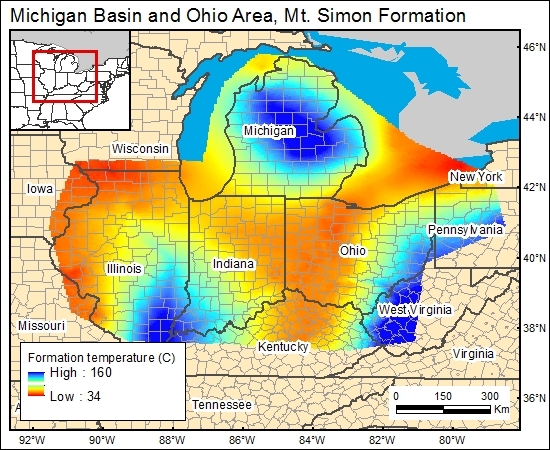 Therefore, we have used the generally accepted temperature gradient for the Michigan Basin, 25 °C/km (Cercone, 1984). We also have used one data point obtained from Vugrinovich (personal communication, 2000). Cercone, K. R., 1984, Thermal history of the Michigan Basin: American Association of Petroleum Geologists Bulletin, v. 68, no. 2, p. 130-136. Vugrinovich, Raymond, 1986, Patterns of regional subsurface fluid movement in the Michigan Basin: Michigan Department of Natural Resources, Geological Survey Division, Open File Report 86-6. Vugrinovich, Raymond, 2000, Senior Geologist, Michigan Department of Environmental Quality, Geological Survey Division, personal communication.